I can’t lie – at this stage of his life, I spend his birthdays wondering if he’ll be around to celebrate his next one. It’s morbid, I know, but that’s where my mind goes. He also shows his old age in his peanut-size bladder. Oy vey, is this the most annoying part of caring for Dutch. He requires upwards of seven walks a day because he just cannot hold it anymore. (And when I say “walks,” this sometimes means just stepping outside to let him pee; it takes about five minutes.) I like to say he’s very “IDGAF” because if he has to go and I don’t let him out assoonaspossiblehurryupMomIneedtogoooo, he’ll just pee on the floor. In front of me. Without a care in the world. How very dachshund of him! He pinched a nerve in his back, which I think happened during a grooming appointment at PetSmart. For a few weeks, he was limping around and unable to run up and down our stairs. He met his favorite celebrity dachshund – Crusoe! – and spent time carousing with other dachshunds at the beach. He had a UTI that lasted for more than a month – poor dude! That was a really, really hard time for all of us. He moved to Tampa and endeared himself to a new roommate, who loves him like a child. He participated in his fourth Running of the Wieners race, and he placed second in his heat. He was violently ill with a bacterial infection, which cleared up instantly after a day on antibiotics. Age thirteen included a lot of visits to the vet, which is just par for the course with a senior dog. Still, I am hoping age fourteen is a lot less crazy and we can go more than three months between vet visits (praying hands emoji). Taking care of a senior dog can be very difficult, and I don’t think I realized just how difficult until I moved out and am now taking care of him on my own. My roommate is terrific and helps me out whenever she can, and my mom is always around to help, but the truth is, he’s my #1 responsibility now. And it can be hard taking him out seven times a day, especially since I live in an apartment and can’t just let him out in the backyard. It also means I have to schedule my life around his walks – I can’t be gone for an entire day unless my roommate is around to let him out. My life is scheduled in four-hour increments. But if this is my biggest issue with Dutch, I guess we’re doing okay. He’s been tested for everything under the sun to ensure his incessant need to go out isn’t an underlying condition, and it’s not. He’s fine – he’s just old and now has to pee a lot. It’s hard to know how to put into words how much this dog means to me. He’s more than a pet. He’s my sidekick, my little buddy, my love. He’s the best part of my day and he makes me the happiest. Happy birthday, little old man! I love you to the moon and back. My good friend Nora sent me the above pin last week, and some of the “rules” made me laugh because they are so true. Like, #3. Dutch is constantly following me around and I can’t count how many times I’ve accidentally kicked him in the ribs because he was just standing behind me when I turned around! Or #6, which is just something I’ve had to get used to. He always finds his way into my bathroom. Always. Rule #11: They are blanket hogs. Dachshunds are burrowers by nature, so they love hiding under blankets. And Dutch has a very specific burrowing technique, where he basically pushes me to the side as he finds the perfect spot for him to lay. I’ve woken up in the middle of the night more than once to find out I have a tiny section of my comforter to myself, while Dutch has created a little fort for himself under my blanket. Rule #12: They can’t control their licker. Rule #13: They are professional snugglers. Dachshunds understand snuggling. Like to the extreme. It’s very rare that I’m laying on the couch and Dutch isn’t snuggled against my side. Or on my legs. Sometimes, I’ll even lay him on my chest and he’ll sleep there. (Because he isn’t spoiled at all!) I adore snuggling with him, which is funny because I’m totally not a touchy-feely kinda girl. But there are few things in life that feel as sweet and good as Dutch snuggled against me. Rule #14: They can be stubborn little jerks. 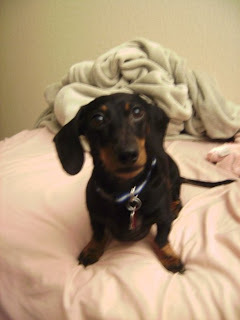 I am a bit glad Dutch came into my life when he was seven and completely house-broken because I hear dachshunds are a pain to house-train, due to their stubborn nature. And Dutch, oh, Dutch is incredibly stubborn. His stubbornness really comes to life when we’re taking a walk outside and he wants to go one way and I want to go another. He’ll dig his feet into the ground, stiffen his body, and resist my tug on the leash. And unless I want to drag him (which no, hello animal abuse!) the way I want to go, he gets his way. I call him a jerk at least once a day during our walks because REALLY. It’s ridiculous. Rule #15: Their bark is worse than their bite. Rule #16: Dachshunds, especially smooth-haired, get intensely attached to a single person. I know this is very, very true for Dutch. He is super attached to me. He follows me everywhere and sleeps with me every night. I often wonder what he’d do if I ever brought a boy home because he gets very jealous when other people try to hug me. Often, my mom will try to give me a hug when Dutch is next to me, and he’ll yelp and growl and try to push his body between us. It’s kinda hilarious, so we often play it up just to make him even more jealous. If you have a dog, what are some of his or her (or their!) personal quirks? If you don’t have a pet, what are some of YOUR personal quirks? 1) He is an extreme cuddler. 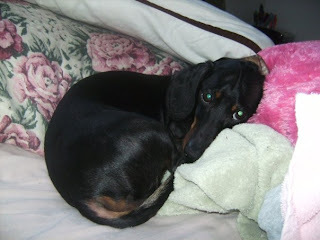 I think all dachshunds tend to be so if you don’t like cuddling, don’t get a dachshund. Dutch wants to be next to me at all times and that means as close as possible as he can get. I love to lay him on my chest and have him just sleep with his face tucked under my chin. Sometimes, he’ll even fit his head next to my face and sleep that way. Look, I am not the most touchy-feely person by nature, but I am with him. I can’t get enough of him and his snuggly ways! 2) He’s an explorer and would probably regularly go on hour-long walks multiple times a day if we let him. We have a lot of open grass and lakes around our apartment community and Dutch loves just sniffing and exploring the area. Sometimes, I’ll let him take me on a hike to wherever his nose is telling him to go, and sometimes, it just drives me mad. My mom’s fiancee, though, lets him take Dutch around wherever Dutch wants to go when they go on a walk. Let’s just say that dog has more people wrapped around his little paw than he knows what to do with! 4) He loves me. He loves me with the kind of devotion you will only get from a dog, completely loyal and fiercely protective. He always has to be near me when I’m at home and he sleeps with me at night. I honestly feel weird if I’m ever alone in my bed without him. The funniest part of this is that, while he does love my mom, he just loves me more. (Sorry, Mom!) Sometimes, I’ll be sitting at the dining room table, my mom on the couch, and Dutch in his bed. My mom will ask him to sit with her and he ignores her. Then I’ll get up from the table and lay down on the couch and within .44 seconds, he’s at my side. It’s basically a running joke now. 5) I talk to him all the time. Like, all dog owners do this, right? I tell him about my day, ask him about his, tell him about upcoming events and sometimes, even my hopes and dreams. My mom and I also like to talk for him, in this really crazy, made-up voice and in our heads, he is extremely sarcastic and hilarious. Maybe I’ll get this on camera one day (but probably not, because it would be incredibly embarrassing). If it’s not apparent, I love Dutch with my whole heart and soul. It’s a scary kind of love, because he takes up such a big piece of my heart and my life and I am terrified of the day I will lose him. But it will happen, hopefully not for another few years, and I will be okay, and there’s no point in dwelling on it now. For right now, I just have to enjoy every single minute I get with him. Share a random fact about your dog or cat! If you don’t have an animal, how about just a random fact about YOU! And he has completely intertwined himself into our family. All it took was a short, 45-minute drive home for him to completely wrap himself around my finger. He arrived a little less than 7 months after the death of my beloved Minnie. Minnie was a dog my mom picked out at the SPCA when I was in fourth grade and we had 11 years before she was diagnosed with lymphoma. We found out about her cancer in late April and we had to put her to sleep on June 8th. It was the saddest day of my life, I have to say. It took me a while to get over her death but by November, my mom and I were ready for a new dog. I am most definitely a dog person and it was rough not having a dog jumping all over me when I came home. And then Dutch came to us. My grandma’s sister gave him to us when she couldn’t keep him anymore. And a mini-dachshund is exactly the kind of dog I wanted. Dutch has been such a blessing to have. He’s become such an integral part of my life. He sleeps snuggled up next to me. He jumps all over me and kisses every inch of my face when I come home. He curls up on my lap when I’m watching a movie or a TV show. He’s the ultimate buddy and I’m so happy he’s my dog. Happy Anniversay, Dutchy-Boy! I love you more and more each day.